The box tends to be an underrated tool at the gym. Most athletes assume it's just useful for jumping; and it also blends in with walls and floors a little too well. But adding height to your workout can help you build power, stability, and confidence. It's also quite versatile, as the creative moves below prove. Incorporate one or all of them into your weekly routine to improve performance and total-body strength. 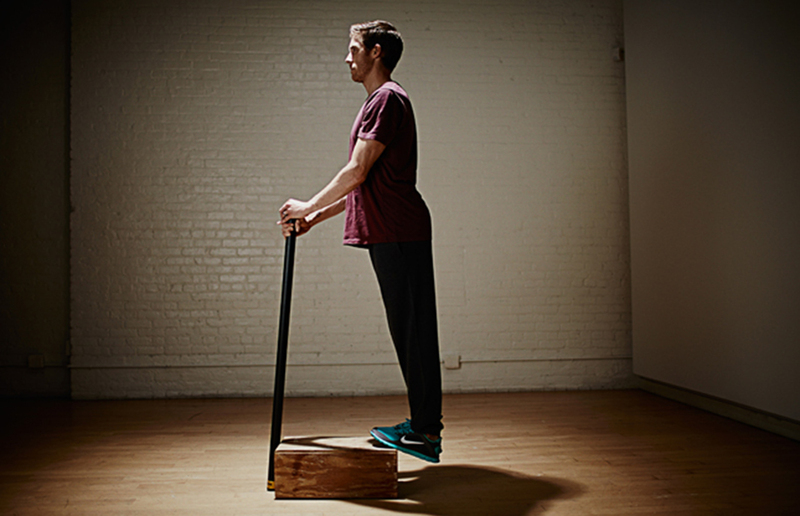 Stand on your toes on the edge of an elevated box and hold onto a body bar to provide balance. Drive your body up by pressing through your toes. From the top position, slowly lower your heels down towards the floor and try to elicit a calf stretch when you reach the bottom of the movement. This lowering process should take about 5 seconds. Return to the top by once again driving through your toes. Do 8 to 12 reps. Hold a dumbbell in each hand, arms extended at sides and palms facing you. Stand with left forefoot on a box or step and right foot on the floor a stride’s length in front of it. Keep torso straight as you bend your knees, lowering left knee toward the floor. Rise up to starting position and repeat. Switch sides to complete set. Do 8 to 12 reps. Stand with legs straddling a raised step (or box), knees slightly bent, arms straight out to sides. Jump both feet up and in, onto step, as you bend elbows in front of chest. Perform a small (or deeper) squat at the top, and then jump back out to start, landing with soft knees and arms out. Do 8 to 12 reps. To modify: Hop up and step back down, and/or lower the riser. Stand on a low box or step. Step off of the box onto the floor, landing with soft knees and absorbing the force as you reach arms behind you and immediately jump straight up, extending arms overhead. Return to starting position and repeat. Do 8 to 12 reps.
Come into a high plank position with the box to the right of your body. Place your right hand on the box, side-stepping your right foot (make sure it clears the back of the box), then bring your left hand onto the box, side stepping your left foot toward the right. Then step your right hand off the box (another right step with the foot) and follow with your left hand/left foot, so now the step is on your left. Do 5 to 8 trips across the box, for three sets.